Tales of Monkey Island - Chapter 1: Launch of the Screaming Narwhal - Join Guybrush Threepwood, Mighty Pirate, in this first chapter of an epic 5-part saga, filled with humor, romance and piratey swashbuckling. When a showdown with the demon pirate LeChuck goes up in flames, Guybrush gets marooned on a strange island. How will he escape? Where is Guybrush's beloved wife, Elaine? And what’s up with the voodoo pox spreading through the isles? 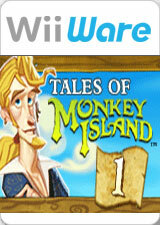 Jump into Tales of Monkey Island today to find out! The graph below charts the compatibility with Tales of Monkey Island - Chapter 1: Launch of the Screaming Narwhal since Dolphin's 2.0 release, listing revisions only where a compatibility change occurred. This page was last edited on 23 January 2018, at 10:41.